As Election Day looms, Greg Abbott and Dan Patrick, the Republican candidates for governor and lieutenant governor, are touring together — a new thing for them. 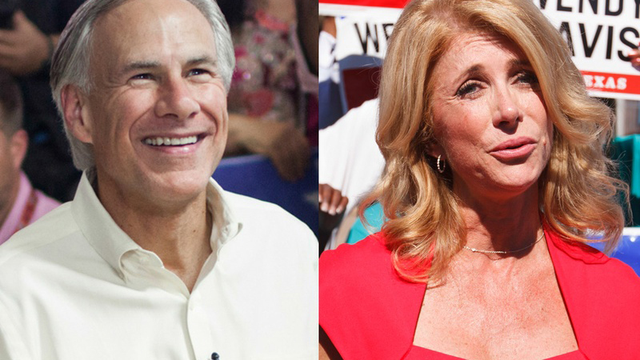 The Democrats they face, Wendy Davis and Leticia Van de Putte, have been together off and on from the start. Joint appearances with other candidates offer a peek at who the contestants think will add to and subtract from their campaigns. Watch who they run to, who they run from and who they just ignore. The teams at the top of the two major-party tickets have decided appearing together is an additive. Celebrities work, too: Abbott made a couple of appearances this week with the actor Chuck Norris, a conservative star, and the actress Eva Longoria spoke at the start of Van de Putte’s statewide bus tour a few days ago. The top elected Republican in the state, Gov. Rick Perry, has been virtually invisible. Instead, he is operating in another political zone, audaciously urging a National Guard deployment on the Texas-Mexico border, publicly trying to deal with the Ebola scare in Texas and making foreign policy speeches in London and California intended to unveil a prospective presidential candidate’s views on America’s place in the world. Spin it Perry’s way — that the state races are behind him now that his sights are set on national office. Or spin it the way the candidates might think — that a fresh start for a new government would be stained by the legacy of a governor who has been in office 14 years. Perry’s record is at the center of many Democratic campaigns, where candidates are reminding voters of education cuts and holes in the state’s health and welfare safety nets. And it is evident in some Republican campaigns, too, where candidates have raised questions about “crony capitalism” and irregularities with economic incentive funds run by the governor’s office. He is the man without a face this year. President Obama’s face, however, is everywhere. Democrats all over the country have spent the better part of the year avoiding the president. His popularity is at a low point, and Democrats remember the drubbing they got in the president’s first midterm election in 2010. That was the rise of the Tea Party and an anti-Washington dust storm so thick it even took out some popular Republicans, like U.S. Sen.Kay Bailey Hutchison of Texas, who lost that year’s primary for governor to Perry. When the president visited Texas to celebrate the 50th anniversary of the federal Civil Rights Act, Davis met with him, but not publicly. The Davis campaign did not want to provide the Republicans with usable evidence that he and she were confederates. In the first debate between Abbott and Davis, the strained association was evident; given a chance to ask Davis a question, Abbott asked if she regretted voting for Obama for president. She balked. “Abbott, what I am working on right now is running for governor of this incredible state and bringing polices forward that benefit this state,” Davis said. Funny: The state’s actual governor was barely mentioned.